Actually I prefer imitation lard. Its way better than that healthy crap. Did Neil Patrick Harris pick up the tab for you? Should have just made a castle out of it. 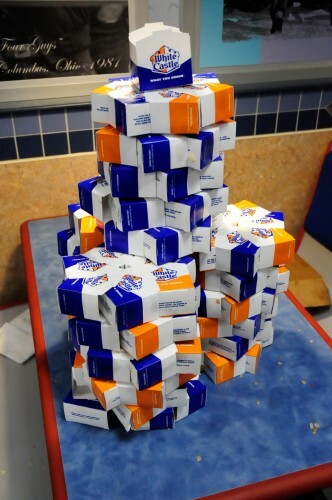 Since, you know, you’re at White Castle. Looks like the Renaissance Center in Detroit. Don’t let the TERRORISTS see it!! A good thing I just ate. That would have made me hungry, and there are not White Castles around where I live, the poor replacement is Krystal’s. But hey, I grew up with WC, not K.
It pales into insignificance beside Vader’s White Castle Of Fear! Far cry 2 keeps freezing for 10 seconds at a time. I thought it was because of shadows because it would lag 10 times in a row when I viewed the shadows on the wall till I turned them down. I turned all the video setting to low, other than 1440×900 resolution and that worked for a while. But then it even froze for 10 seconds after that. It’s only happening in far cry 2 – no other games.